I started pencilling this image for Soft Companies in October 2005 in Glasgow, the day before I started an art contract with Backbone Entertainment. I got as far as the head and arms, and I thought ‘Nice, i’ll finish up these pencils over the weekend’. Unfortunately, other work came in and the contract work was quite intensive, so it got shelved. Fast forward to September 2007, I found this drawing as I was moving over to London, and decided to pencil in the axe and shotgun. Fast forward to now, as I’m working on the Soft Company sourcebook, and getting ready to move back to Scotland. 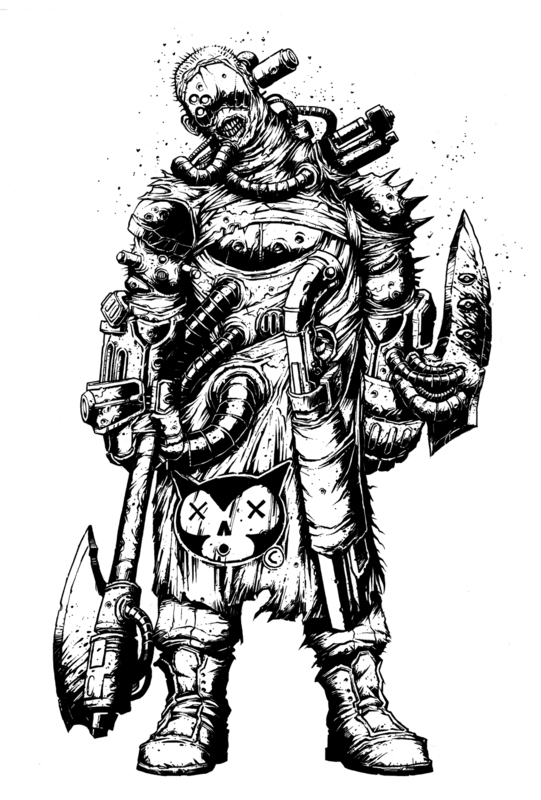 Godammit, it’s getting done – so I finished up the boots, and inked the bugger. But ….. it’s *still* not done yet, and I have to greyscale it before it will be classed as complete. Will it be completely finished before the end of 2009? Wait and see! I used to be blown away by the number of check-board capes and such you did for SLA. Couldn’t help but think they must be a total bugger to get right. It was actually Clint Langley who started the check-board cape and piping style in SLA when the first round of his art came. Once we got that new stuff in, SLA got even grittier! I think the Soft Company sourcebook is going to shoot a 5 inch hole between my eyes when I open it. hell yeah!!! looks great dave, as always.